Did the Duchess get inked? Well, sort of. Before you get any crazy ideas about the Camilla, the Duchess of Cornwall (or, heaven forbid, the Duchess of Cambridge!) 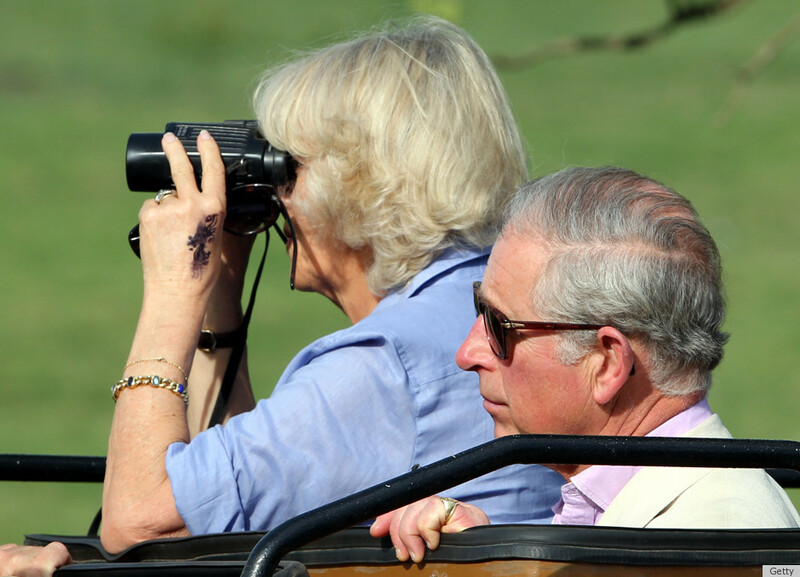 getting an armful of tattoos, the Daily Mail assures us: Camilla simply got a henna tattoo, made from a plant-derived dye that binds temporarily to the skin's surface. Why the "ink"? Duchess and Prince Charles recently returned from a lengthy trip to Africa, where they traveled and tried out all sorts of native traditions, from different food to some awesome Zulu hats. Prince Charles even caught up with some African models and talked fashion (hint: he's not exactly the trendsetting type). But, as the Daily Mail reports, there's just one problem: it won't come off. "The less said about that the better! I didn't feel that I could refuse and it was rather beautiful but then, after I had it done, this lady put her hand on mine and splodged it everywhere. I just can't get it off. I have tried scrubbing and everything... nailbrushes, you name it. I just don't know what to do." She'd like it off, the royal said, given the number of high-profile events coming up. She was able to hide it for Remembrance Day last week, wearing chic black leather gloves for the UK's large public ceremony. But the duchess appeared at Clarence House today for a children's theater event with the tat still visible, albeit faded, on her hand.